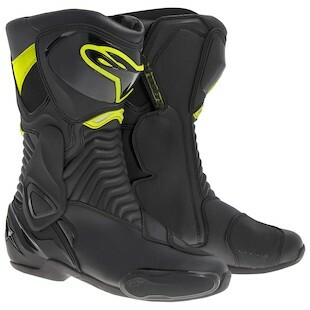 Offering track level protection, a comfortable fit, and a beginner-friendly price, the Alpinestars S-MX 5 Boots were a huge success. Alpinestars knows well enough to not mess with a good thing, so with the new-for-2014 SMX-6 Boots, they made small changes to improve upon an already great product. Evolution, not Revolution here. 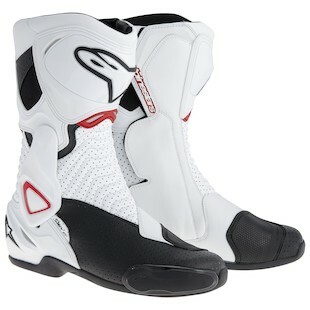 Fans of the outgoing S-MX 5 will instantly recognize the new Alpinestars SMX-6 Boots. The colorways are slightly different on the SMX-6 with a simplified stitching pattern and a smoother overall appearance. Happily, Alpinestars is offering an alternative to the classic black look with a white version featuring black and red accents. For the Neon aficionados, there is a black with fluorescent yellow color scheme to best channel the VR spirit for added speed and lower lap times. The SMX-6 is still designed as an entry-level track boot, or a very protective street boot. The biggest difference over the outgoing S-MX 5 is the addition of a TPU lateral ankle brace. This allows for a natural upward movement of the foot when shifting, braking, and walking, but prohibits excessive downward movement of the foot to protect against hyperflexion injuries. Additionally, the TPU brace adds structural integrity to the boot and helps protect against lower-leg torsional injuries. Further protection is offered by a double density ankle protector under the upper construction, as well as a TPU calf protector, heel cup, and toe box. The last thing you want is a broken tibia from a rear seat going through it in a crash. To prevent this, the SMX 6 have a TPU shin guard as well. If you have the combined raw talent of Marquez, Lorenzo, and Rossi, and cannot imagine riding a motorcycle without dragging your toes on the tarmac, good news! The SMX-6 have replaceable TPU toe sliders. The most protective boot in the world won’t do any good if it is too uncomfortable to wear and ends up sitting in a closet. For comfortable everyday wearability, the Astars SMX 6 feature a durable and flexible micro-fiber upper construction with a breathable textile interior lining and anatomically correct insoles. There are air vents on the heel cup and shin plate to keep your feet cool even when you are on your hot lap. If your hot lap is particularly warm, then pick up the Alpinestars SMX-6 Vented Boots instead, adding another bright colorway into the mix along with the perforation. Aiding everyday versatility and ease of use is a medial side entry system with a single zipper and Velcro closure. This provides a wide access so you can get the SMX-6 on in a hurry a few minutes before your track day group rolls out of the pits. The Velcro allows adjustability for riders with wider calves, and keeps the zipper pull in place so the boot does not loosen throughout the session. Any rider on a budget looking for great protection on the street or the track need look no further than the SMX-6. Alpinestars knocked it out of the park with the last generation S-MX 5, and the changes made for 2014 will only improve the breed. Now what are you waiting for? Grab a pair, get your knee down and scrape some toe sliders!